South Africa is one of the most exciting countries in the world to hunt. It offers a diverse combination of landscapes, vegetation and wildlife together making it a unique destination for the safari enthusiast to Africa. The Malaria Free Eastern Cape offers the finest hunting in the country with over forty different species of plains and dangerous game spread across large tracks of land spanning vast semi-arid desert, dense coastal forests, mountains and open savannah. We have access to three million acres of privately owned land and game reserves, including over seven hundred thousand acres of free ranging areas stretching from the coastal forests along the Indian Ocean, to the unsurpassed beauty of the Great Karoo, and the breathtaking mountains of the north - hunting the game in their natural environment and habitat where they are naturally of better quality. With over forty different species available to our hunters, and many occurring in a variety of habitats, we have found the need to establish camps within the moister southern and drier northern regions of the East Cape. This often allows our hunters to enjoy the variety of a multi-area hunt on the same safari, while ensuring we achieve the very best in trophy quality. While hunting South Africa you are not limited by hunting seasons, but we prefer our season runs from early March through late October. During these months the Eastern Cape boasts a moderate climate, making for comfortable hunting conditions. 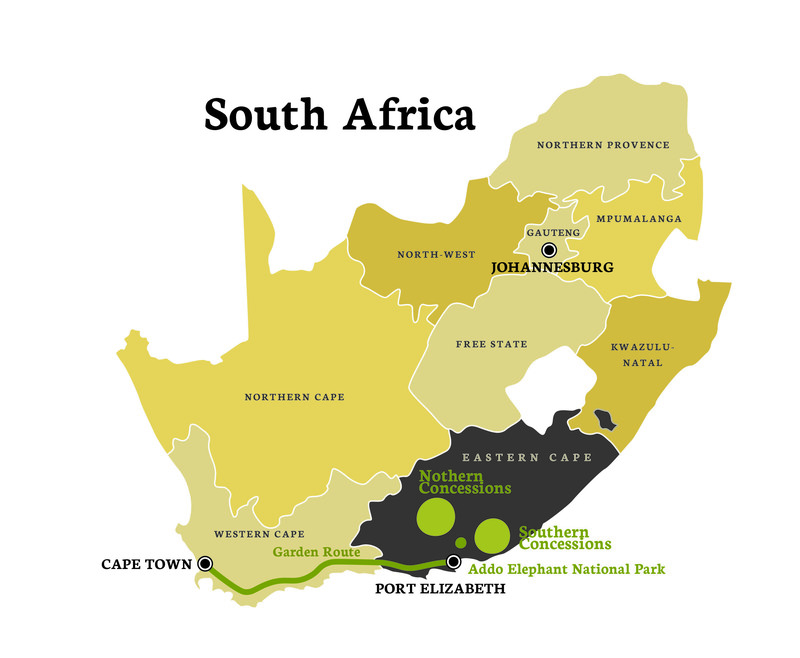 This combined with first class lodging and numerous tourist attractions, makes the East Cape a world class destination for both hunter and non-hunter on safari. Our southern base, Woodlands Safari Estate, will be the starting and finishing point for the majority of our safaris. Camp is situated a mere two-hour drive from Port Elizabeth, making for comfortable arrival and departure days. The Manor at Woodlands provides for a lodging experience from yesteryear with a colonial atmosphere and grandeur from a forgotten era. Rooms are spacious with en-suite bathrooms in a tranquil setting, combined with modern day luxuries. Air cooled in summer and wood stove heated in winter, you can rest assured you will be comfortable whilst enjoying the privacy of your room or the passing parade of game frequenting the water hole below camp. Dinner in the evenings is an opulent family affair with local dishes, wines, hunted game, and decadent sweets gracing our table. After dinner, enjoy a retreat to either the pub or a crackling campfire sharing in the day's adventures while the ever present nightjars sing the night away in a hypnotic African chorus. This is big country. The area, a mere three-hour drive from base camp at Woodlands, spans from the plains of the Great Karoo, with its large herds of game, big mesas and steep gorges, to the breathtaking mountains of the north. Here you will experience endless opportunities on plains and mountain hunting, with the freedom of days gone by. Nestled amongst the acacias on the banks of the Sundays river lies our secluded Mountain Retreat in the north. It’s a quiet setting, comprising the main lodge and five separate chalets. Each chalet enjoys an en-suite bathroom, as well as air conditioning and fire place for cold winters evenings. Summer days can be hot, with hunting taking place in the early mornings and late afternoons, making a dip in the pool a refreshing reprieve from the heat. Karoo style cooking is the order of the day, with lamb, springbuck and various local delicacies, paired with some of the finest South African wines making for a special dining experience in the north. Hunters interested in our popular free range, low fenced combination hunts, can look forward to a challenging experience during June and July each year. Hunt a variety of species from secluded camps throughout the Karoo, while memories of the day’s hunt flicker through one’s mind as the brightest stars on earth dance about the milky way to the deafening sound of silence. The East Cape Experience is like no other. It may be the people. The land. The camaraderie around a crackling campfire. The PH and tracker who started out as strangers, but leave you as friends. Or it may be the abundance of game and the sheer variety on offer. It’s the feeling you’re left with to return again. It’s hard to explain. Join us and you’ll understand.